Once upon a time, okay, more like two years ago, we found ourselves in a guy's garage looking at some antique furniture that was advertised on Craigslist. The furniture didn't really turn out to be what we were looking for, but we did spy this old wall cabinet in the corner. It was very worn, had different colors of chipping paint, and was extremely dirty. But, it was pretty sturdy and it had some cool old writing on the side. 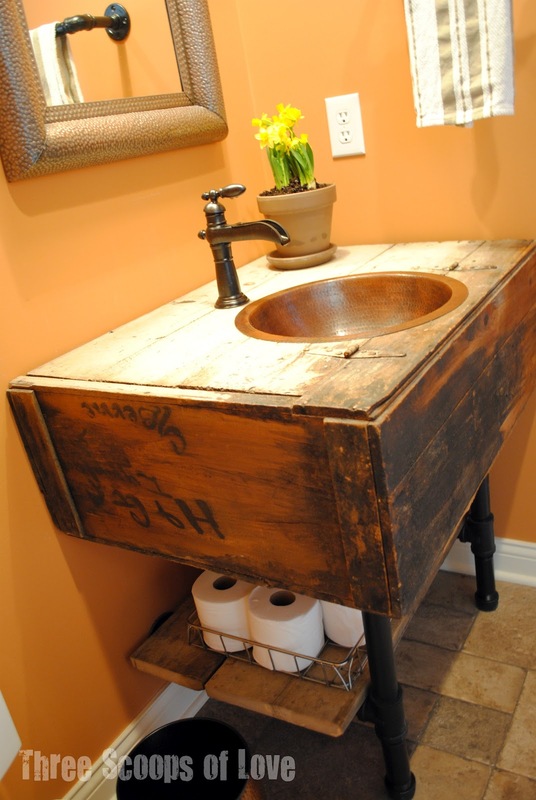 It looks like maybe someone used pieces of wood from a shipping crate to make this at one time. That's my best guess, anyway. We weren't exactly sure what we would do with it, but my husband suggested transforming it into a table or maybe even a bathroom vanity. Love that guy. So, we brought it home and it sat for quite a while. Fast forward a couple of years and we dug it out during our housebuilding process and planned to use it as a vanity in our powder bath. After a rough cleaning, we turned our copper sink bowl over and laid it out to get the placement where we wanted it. We traced around the outer edge lightly with a pencil. We drilled a hole to get started with the jigsaw. We made sure to cut on the inside of our traced line so that there would be an edge for the sink bowl to rest on. After our hole was cut for the sink, I cleaned the entire box and then I cleaned, cleaned, and cleaned it some more. 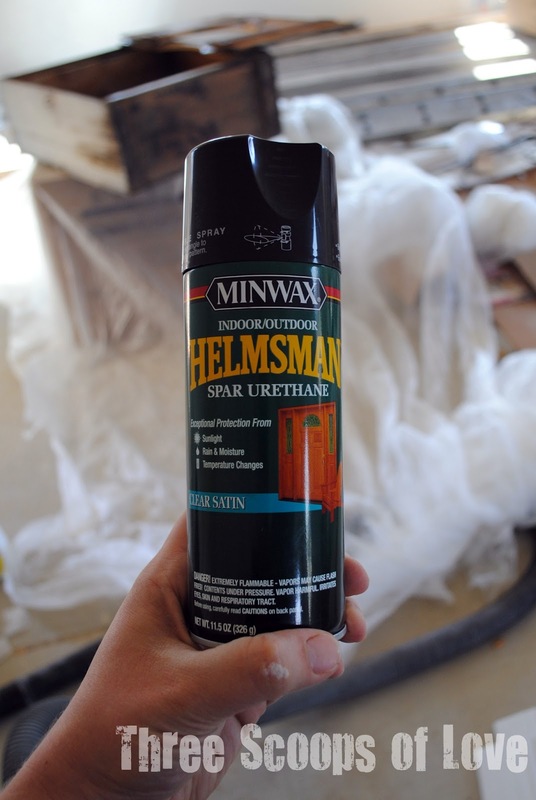 We decided to use a spray polyurethane to protect it against water as much as possible. I also wanted to seal in everything that was already on the box. Even though I cleaned it as thoroughly as possible, the paint was old and who knows what had been on or in that box in the past. 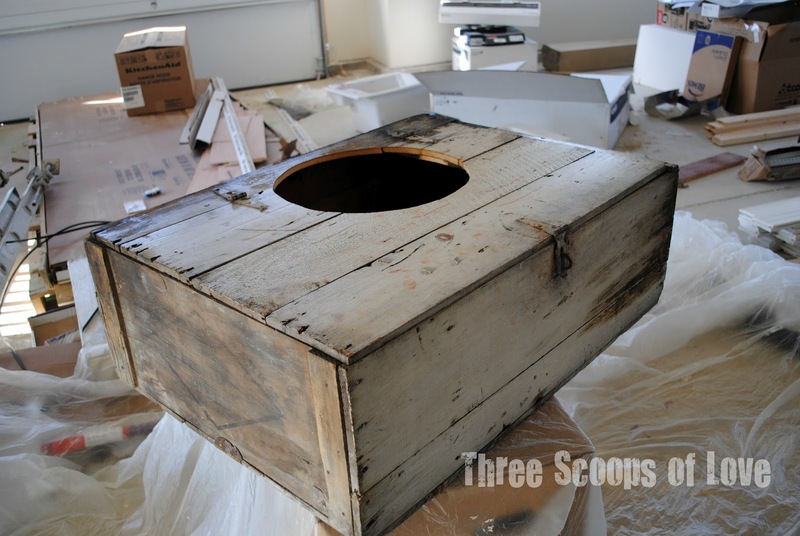 The inside and outside of the box got at least three good coats of polyurethane. 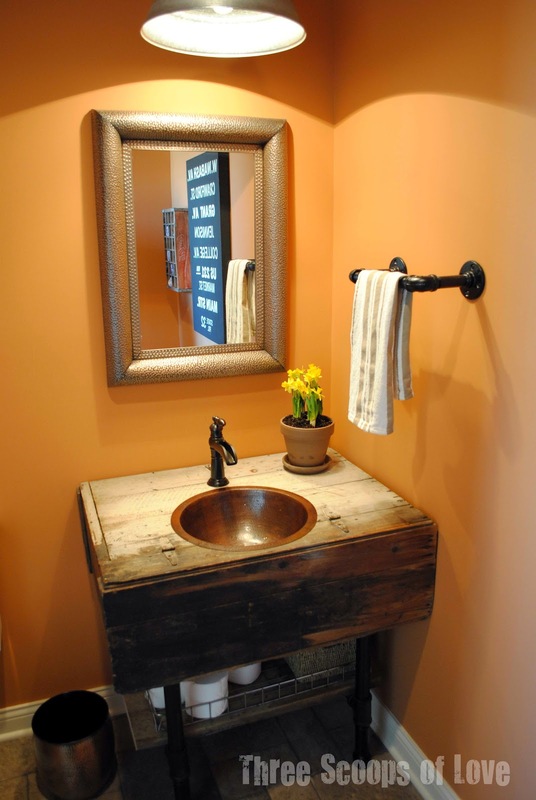 When it came time for installation, we bought plumbing pipe, couplers, and flanges at the hardware store and built a simple base for the vanity. We kept it simple and used two legs and then had return pieces that would screw into the wall with the flanges. 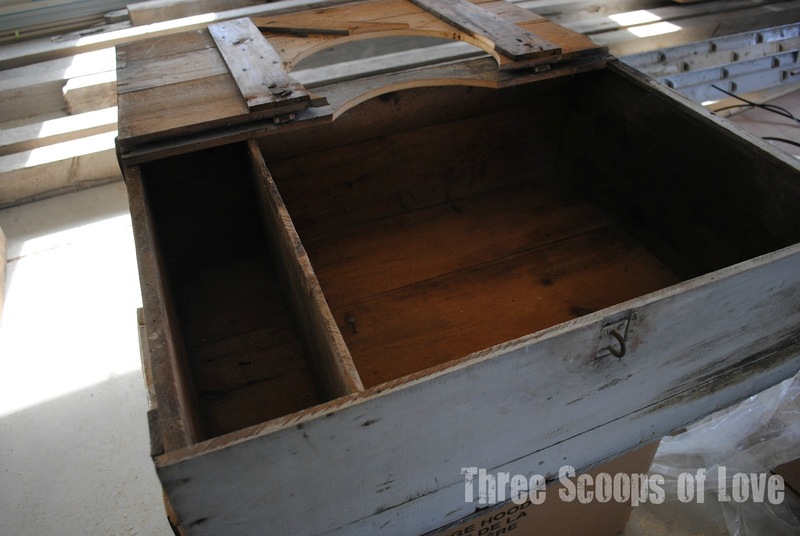 The return pieces also allowed us to have a storage shelf about half way down the legs. 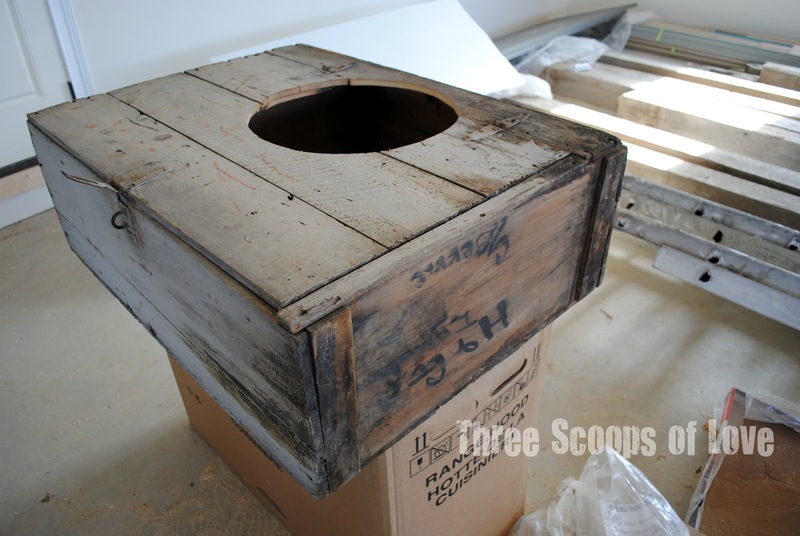 At this point, we also cut holes in the bottom of the box to allow for the plumbing to attach to the sink basin and drilled the hole for the faucet. After dropping the sink basin in and attaching all of the plumbing, we attached the sink a bit more permanently with clear silicone under the lip of the basin. I love it! It looks great with the rest of the house and it's definitely a conversation piece. For the shelf, I cut two lengths of barn floor boards leftover from our kitchen shelving project. They are simply resting on top of the pipe. I added an old metal bread basket from a bakery to hold toilet paper and a small basket of essentials. It's been in use almost three months now and the water has not been a problem. 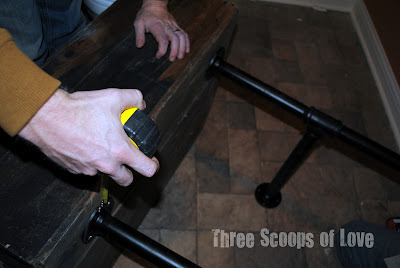 I have tried to train my kids to wipe up any water drips on the wood, but it still happens. So far, it still looks good as new, well, good as old? Wow, awesome job!!! Such a creative way to use an old cabinet!! It looks wonderful! That is so fantastic! I'm in love...now I'm on the hunt for old cabinets! So creative. This is awesome. I love it! It looks so great and is a perfect scale for your powder room! Great job! Ohhhh my word. This is GORGEOUS! It's amazing! I feel like I need to be on the hunt for old reclaimed cabinets now haha. Great job! Fantastic!! I wanted to do something kinda like this in our bathroom but could never find anything so I went with a good old ikea vanity. Yours looks awesome, so much character!! What a great idea!!! It is so unique and adds beautiful character to the bathroom! WOW! What a great project! Good for you - I love the way this turned out and the bathroom has so much character now! This is so creative...love it! Saw the link on Funky Junk's Saturday Night Special. What a great idea, and you even followed through with the idea and made it happen! It turned out fabulous! Though I love my husband dearly, I wish mine was like your and could see "junk" and what it could become, but all he sees is junk! Stopping by from SNS...Very cool transformation! Thank you so much, Donna! I appreciate the Facebook and Pinterest love. We absolutely love it and it makes me happy to think that it might inspire others to do something a little unconventional, too! I am your newest follower. That was such a great "show and tell". It makes me think even I might be able to do it! Great partners make great goodies. 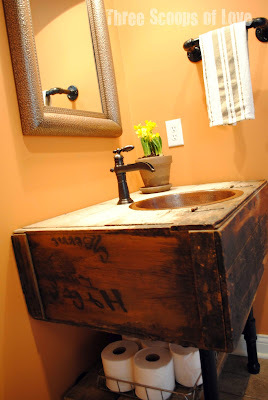 I love your reclaimed vanity! Well...be still my heart!!! LOVE IT! 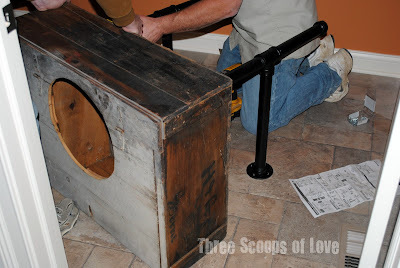 I will scour my barn for a fabulous trunk or cabinet to do this with. I would love to know where you purchased the awesome copper sink? Wow! True love. . .
Amazing - so impressed that your husband was on board (and even inspired?) this transformation. I love how you chose to keep it as authentic as possible, and how you used the simple plumbing pieces for legs. Beautiful! That is so brilliant! Amazing! I hope you don't mind that I pin it... ? It's just incredible! Great job! I adore this! I made a old shutter into my bath countertop..and I love the repurpose of it all! Yours is awesome!! freakin' gorgeous! you rocked it! Love it... found you through Donna's Funky Junk Interiors! WOW WOW WOW,I totally love this. I love it when people think outside the box and comes up with something totally fabulous. I'm now following along! It doesn't happen all that often, but every once in a while I am just stunned at a project a blogger shares that is so outside the realm of creativity. I HATE my builder grade pedestal sink in my guest bath, and we have tried everything to disguise it. I had pretty much given up, and decided I was just going to have to wait until inspiration arrived at my doorstep. Well, today it did. I am so glad I went to visit Donna's site today. Your directions and pictures make it so easy to duplicate this look. I may not get to this project for a few months, (there are several projects in line before the bathroom), but it is going on the permanent list. Thank you so much for sharing this. I am pinning it and showing my husband. And....if you have time, I have a link party that runs every weekend and ends tonight at midnight. I really would love to share this project with my readers. I would love for you to stop by and link this up. I am so in love with your vanity,,, OMG it is amazing. So rustic and country looking. Hopping over from At The Picket Fence. Your vanity is terrific. Beautiful work!! This looks fabulous!! I've been looking for a creative base for a vessel bowl I found on craigslist and has really inspired me. Thanks for sharing your process, it really turned out beautiful. What a great idea, this vanity is amazing! I am your newest follower. Found you through the jewelled drawer pulls you made that are pinned on Pinterest. Hi! Can you please tell me where you bought or how you made your towel bar? I live in a house built in 1765 and it would be perfect for my bathroom makeover. thanks! very nice blog thank full to blogger.